When our motivation and mood are at an all-time low, we only need to look at the exciting, sublime photography of Josh Anon for an instant boost of inspiration. 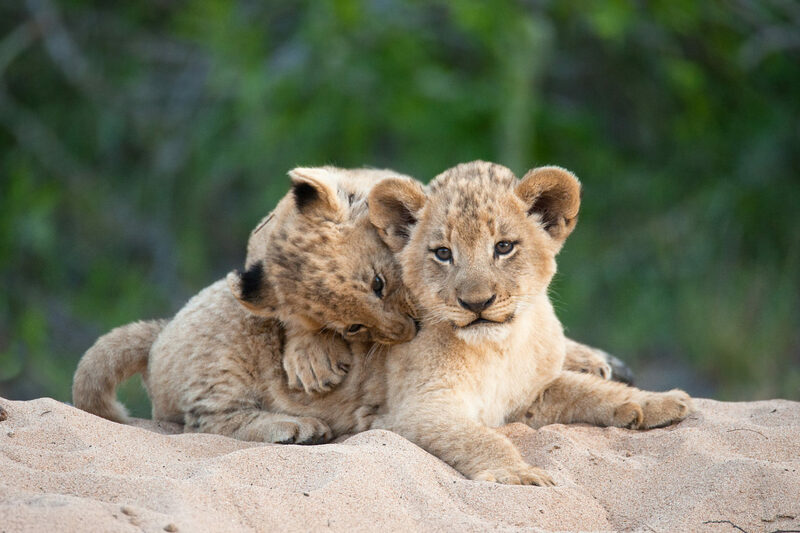 Not only has he been a wildlife and nature photographer for 20 years now—he has also worked as a cinematographer at Pixar Animation Studios, and was a senior product manager at Lytro. Traveling around the world and capturing real moments that we can only dream about, many others will agree that his images are extraordinary; his award-winning work has been exhibited in venues and featured in publications around the world. 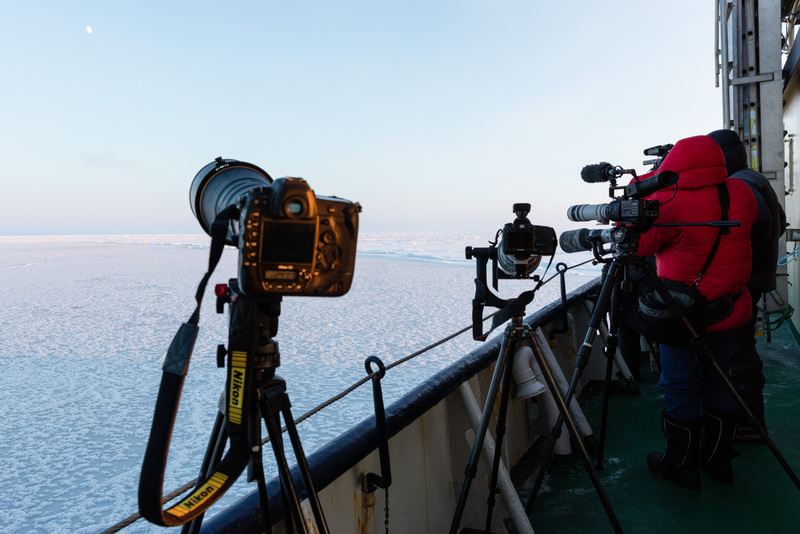 This week, we’re spending an action-packed 24 hours with him in an Arctic expedition. If you’ve ever wondered what an entire day is like shooting in sub-zero temperatures, read on to see his story in pictures—along with some 360° shots! 12 A.M. It’s midnight. There are two thoughts running through my head: “Wow, this is beautiful,” and “I have to pee.” I’m on one of the first ship-based winter expeditions in Svalbard, lying in the snow on Moffen Island just beyond 80° north. 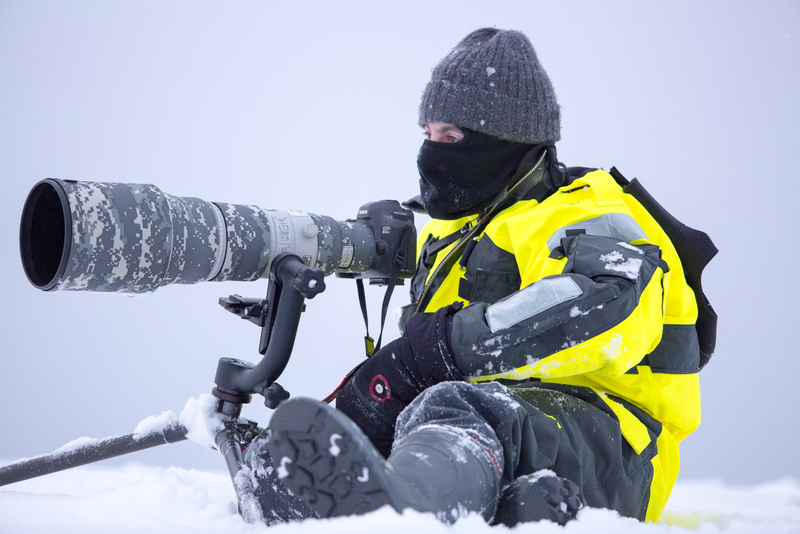 I’m photographing a walrus in the snow. The 15 of us (four Norwegians, three Americans, two Swedes, two Finns, one Brit, one German-Mexican, one German, and one Russian) spent the past four hours watching six walrus lie in the snow, watching the beautiful low Arctic sun appear and disappear while a periodic snowstorm blows through. Most of the time, walrus just lay there, so you spend hours with your ideal shot lined up, waiting for the brief moments of action, hoping those moments come when the light and weather are in your favor. It is cold. 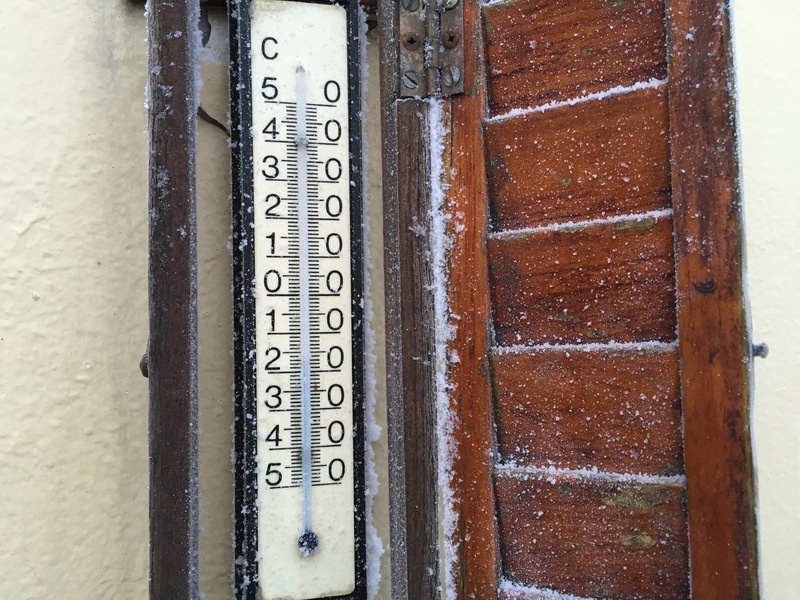 It’s around 0°F. 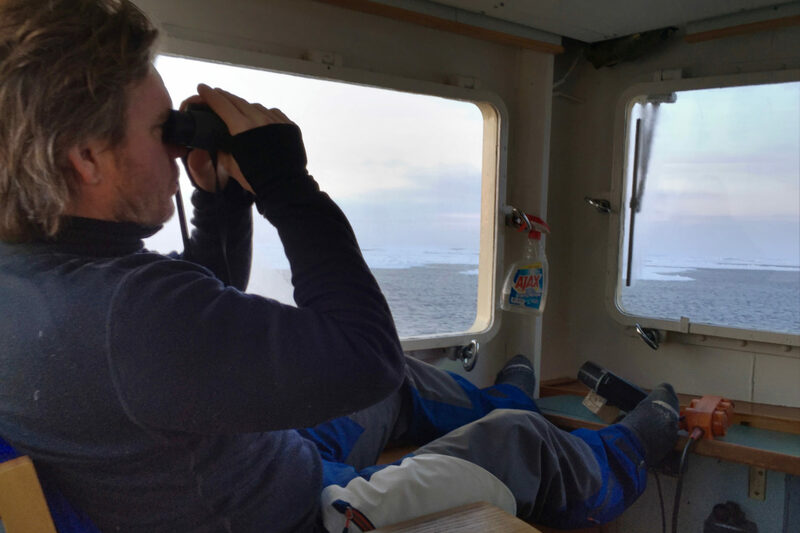 One of the Svalbard government’s requirements for this expedition is that we wear immersion suits anytime we take a zodiac out. So instead of wearing my nice down-filled GoreTex jacket, I’m wearing a rubber jumpsuit. Beneath it, I’m wearing two layers of long underwear, insulated pants, and a sweater. And after lying in the snow for hours, cold diuresis is setting in, and my brain and bladder are having a debate. 1 A.M. Ultimately, we go back to the ship. 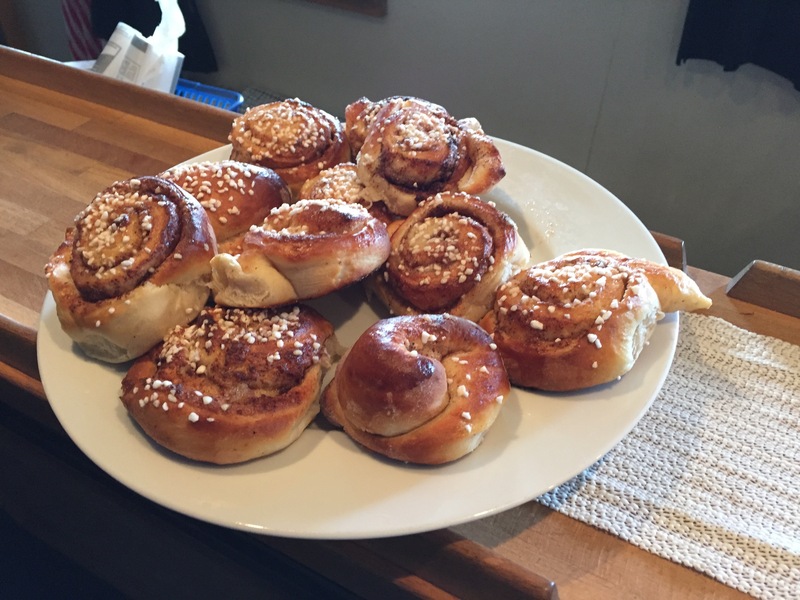 The ship’s chef had made some cinnamon rolls earlier in the day. The crew graciously put them out for us as a midnight snack while we warmed up. 2 A.M. I’m too excited to see what I shot to sleep, so I download my cards while warming up. I finally fall asleep. 8 A.M. I wake up. Breakfast is officially at 7:30 a.m., but because it’s around the first days of the midnight sun, where the sun never fully sets, we’re often out photographing until the odd hours of the morning and end up missing breakfast. Fortunately today, I make it to breakfast in time to grab some yogurt and oatmeal. 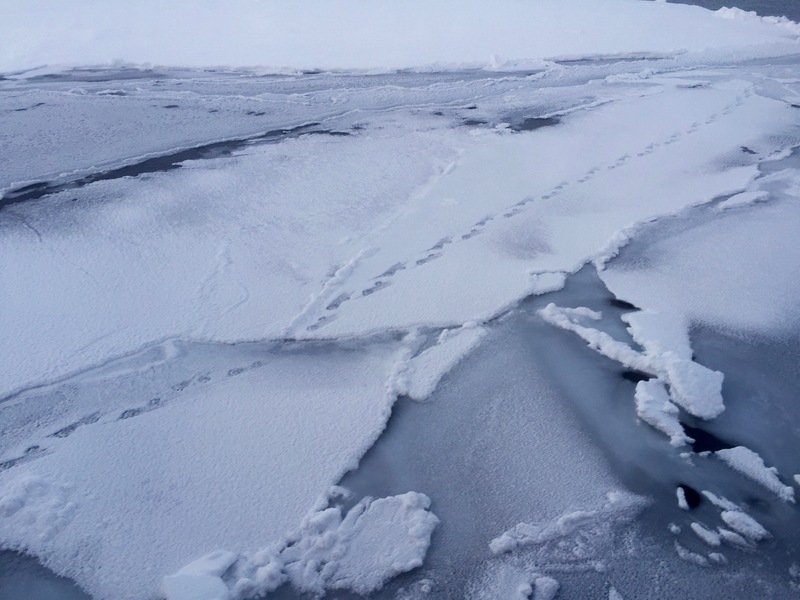 While we were asleep, the crew brought us to the edge of the ice. This where we’re going to look for polar bears. Finding a little off-white dot amongst a vast white landscape of moving ice and snow is hard. One of my fellow passengers jokingly says, “Polar bears live up here? I’ll believe it when we see one.” We’ve already spent over a day previously searching for bears with no luck. If they don’t want to be seen, you’re not going to see them. 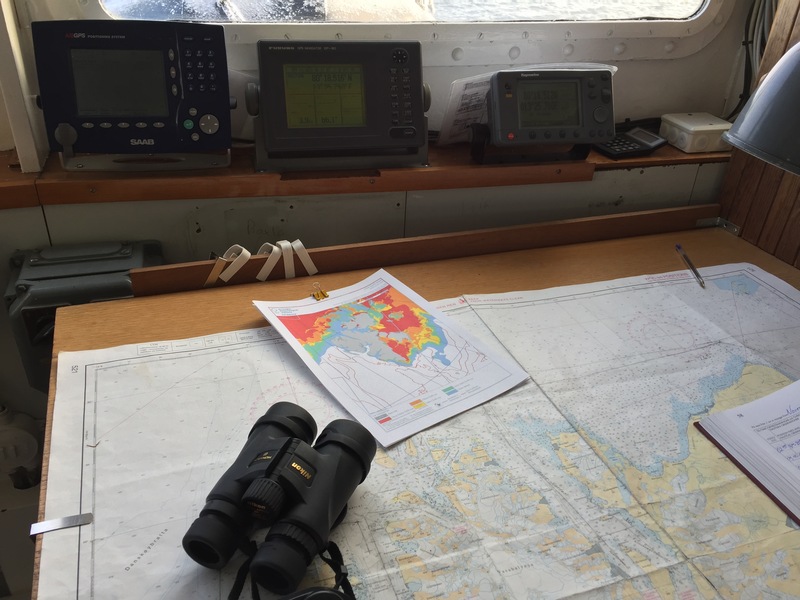 Our talented expedition leader, Martin Enckell, spent hours searching for bears. Here, we’re able to see the impact of climate change first-hand. 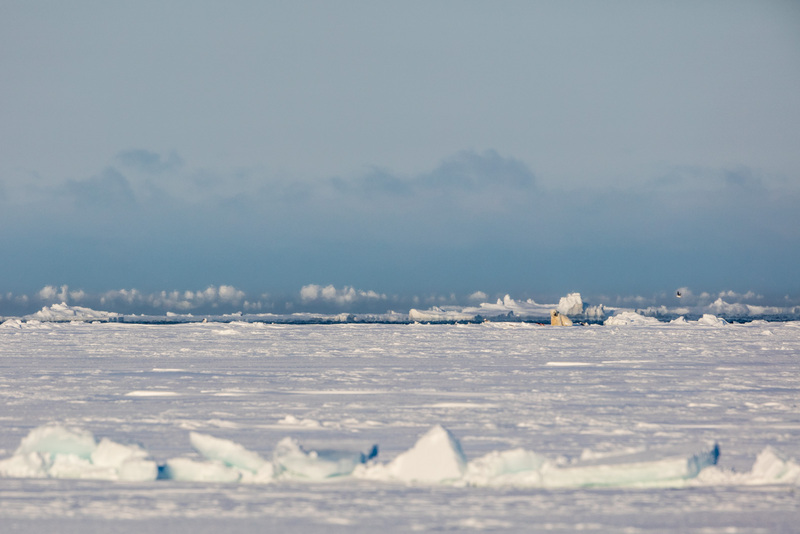 There’s less sea ice, and it’s further north this year than before. While scientists are constantly learning new things about polar bears, we know for sure that many bears need the ice to live, hunting for seals on it. 12 P.M. After a few hours, we’ve found no polar bears. It’s time for lunch. Today’s meal is pancakes and pea soup—”Thursday food.” (It’s a Swedish thing, and our crew’s Swedish). The captain parks our boat in a piece of ice, so that we don’t have to stress about searching for bears while eating. 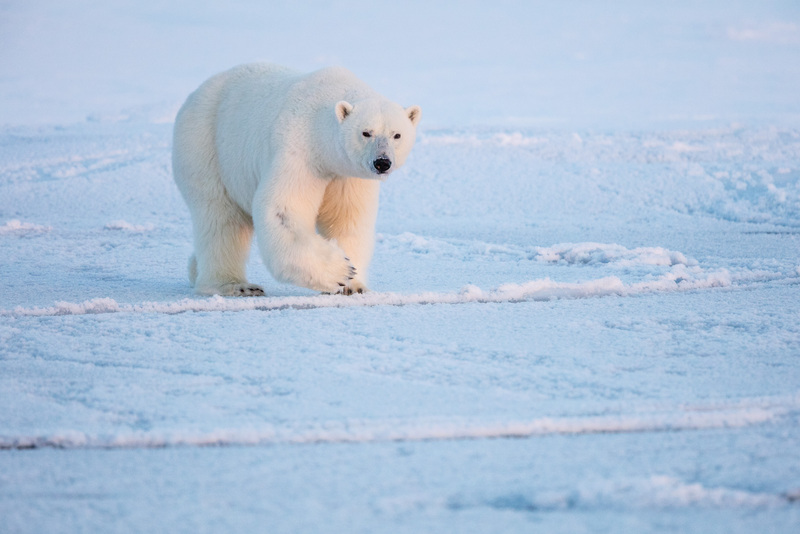 Plus, some polar bears are curious, and it’s possible that staying in one spot will attract a bear to us. After lunch, I go up to the crow’s nest to take a 360° shot of our ship and the landscape. 12:30 P.M. Given how bright it is outside, I take a short nap so that I can stay up late, helping to look for bears when the light’s good for shooting. 5 P.M. Later in the day, the light’s getting beautiful, but it’s also getting cold. We can see the frost accumulating on the ship. Condensation from taking our equipment in and out of the cold is a real risk. If we’re not careful, it can kill our camera gear. 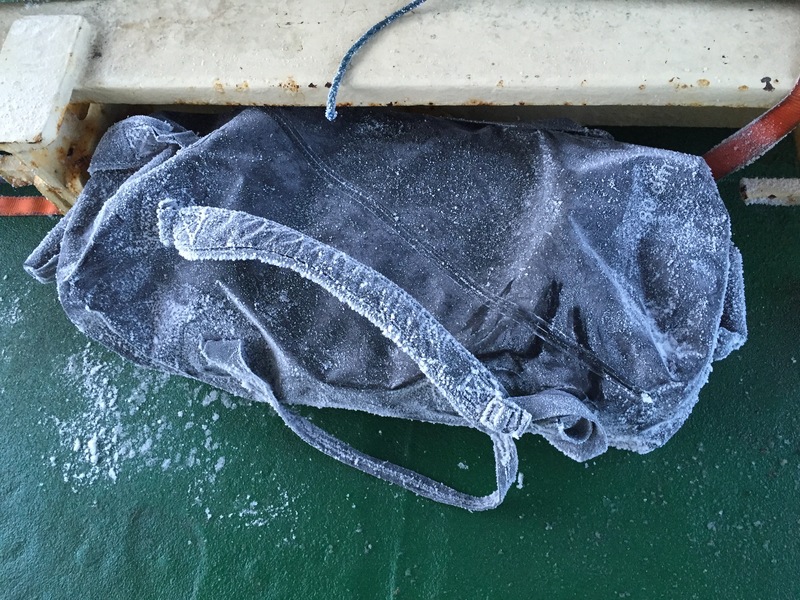 We’ve been keeping our gear cold outside, in dry bags, and taking the batteries and memory cards inside as needed. As much as it stinks how much our big DSLRs weigh (for anyone from the airlines reading, my camera bag always weighs no more than 17lbs/8kg). Smaller cameras are just not rugged enough for this environment. Two passengers’ D800s have died in the cold. I’m just happy my 5DS are still working. My camera and gear bag. We’re fortunate to have maps, updated daily, showing us where the best sea ice to find polar bears is. But we’re still having no luck finding them. Desk with maps on the bridge. The most we’ve seen are some bear tracks, but we have no way to gauge how old they are. 7 P.M. It’s time for dinner. Hey, staying warm and looking for bears takes energy—and the chef’s made a delicious meal of lamb. Food on ships vary a lot, but it’s generally quite good. On this trip, the chef is easily on par with chefs in high-end San Francisco restaurants, which is pretty amazing, given that he’s working in a small kitchen on a moving ship! 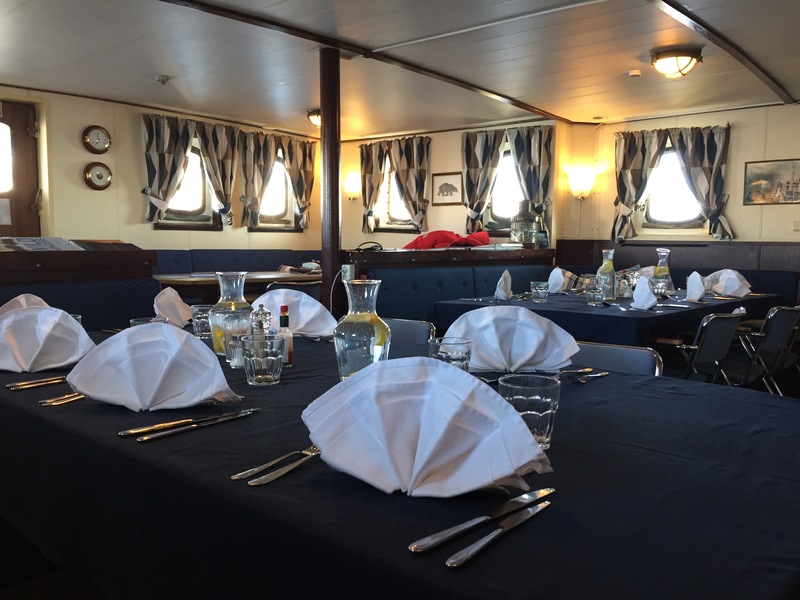 With only 15 passengers, there is one main dish for each meal, but the chef has also managed to accommodate everyone’s dietary preferences and needs. 8 P.M. After dinner, it’s time to look for bears again. I’ve spent most of my day looking at this view. It has become really beautiful outside, with soft light illuminating the little wisps of fog above the water in addition to the low, colorful sun. 9 P.M. Suddenly, there’s some commotion—we see a yellow speck, and it’s moving! And there are birds flying around it! It’s a bear! Everyone rushes to put on warm clothing as the Captain maneuvers the ship towards the bear. We’ve gotten to where we can see the bear and its kill through our cameras (with 500+mm lenses). But unfortunately, with how the ice is, we can’t get any closer. Having finished eating, the bear is lying down for a nap. He’s not going to come check us out. Bear One in the distance. 10 P.M. We’re back to looking for bears. Within an hour, we spot another one. This one’s a curious bear, and we can see him change course to check us out. 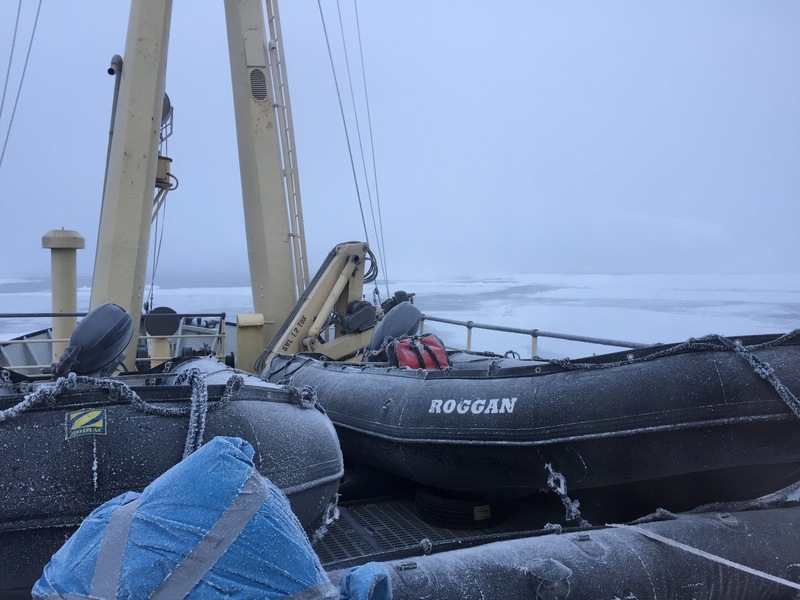 We stop the ship and put on warm clothing (long underwear, down-filled pants, a sweater, a down-filled jacket, inner socks, toe heaters, outer socks, inner glove liners, hand warmers, and outer gloves). Then, we head outside to wait for him. Even though our ship’s over 50 years old, we all love it because it’s very low to the water. 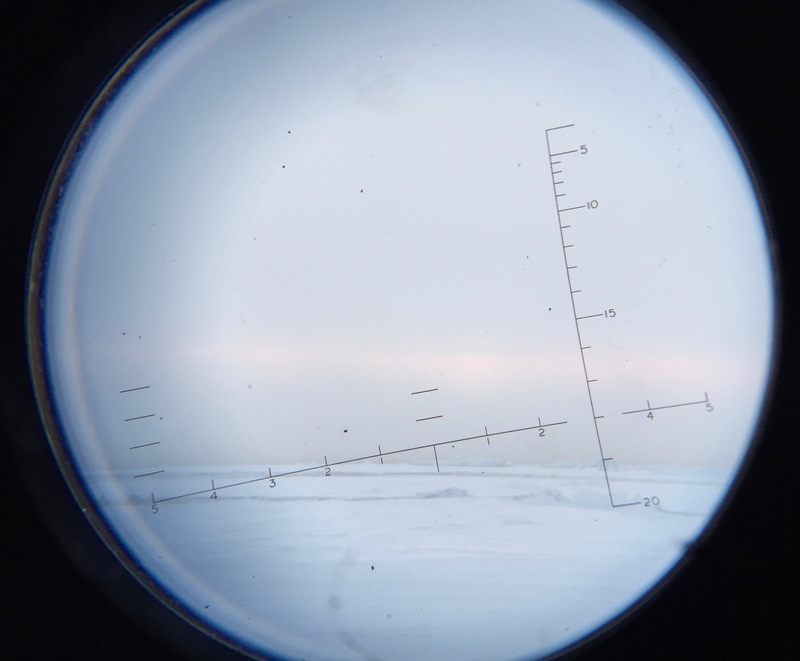 Standing on deck with a tripod will put us just above eye level for a bear, and there are a few portholes we can lay down and shoot through, giving us an eye-level shot. Shooting on the deck with the bear and moon in the distance. We stay with this bear from 10 P.M. until early the next day. This bear was a fantastic “photo” bear, coming close to us multiple times and staying interested in us. The soft Arctic light made for beautiful pinks in the sky, and it reflected on the ice. We were happy to see that he was a big, fat healthy bear too. 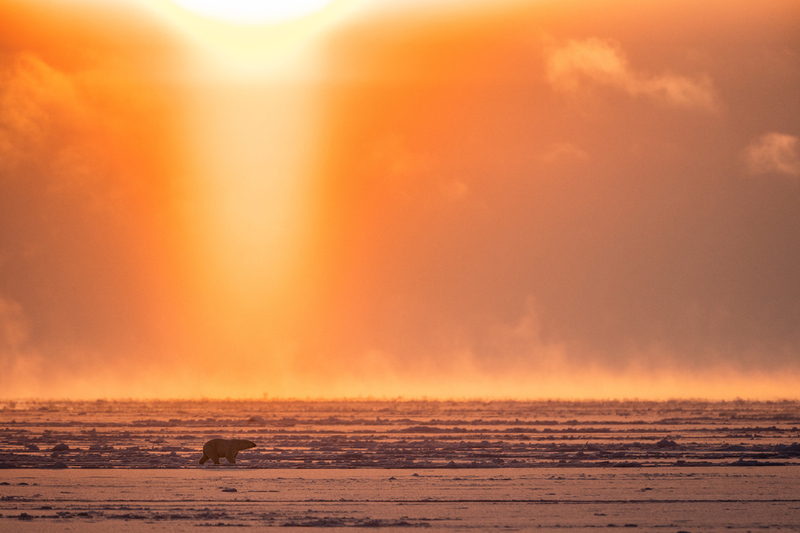 When the bear grew bored with us, we positioned the ship so that we could see him walk in front of the low sun. Backlight is pretty awesome. A.M. Next Day. 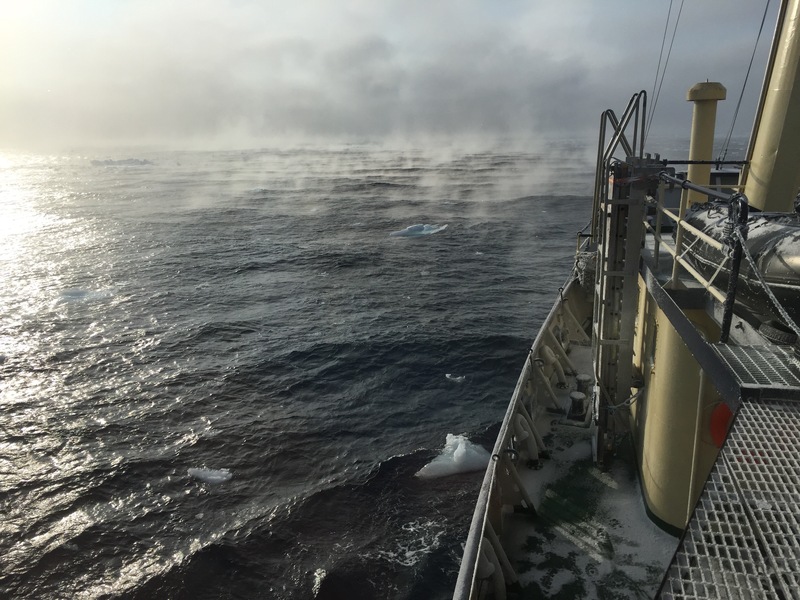 Well into the morning, we’re all excited about such a great encounter…and partially frozen. We go back inside to warm up, download our cards, and to rest up for another amazing day in the Arctic. See my full trip gallery here, and read the official trip report here. Let me know if you ever want to go on a trip! We hope you picked up some great tips and insights from Josh Anon during his expedition. For more inspiration, scroll down for a jaw-dropping collection of images taken by him over the years! To see more of Josh Anon’s work, follow him on 500px. You can also check out his website and Twitter to connect with him. Got any questions for Josh about his shooting schedule, his process, or his images? Leave a comment for him below!